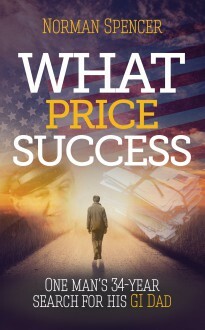 Our self-published books: What Price Success? Norman Spencer spent his young years believing his mother’s story that his father had been an English soldier, killed in World War II. It was only when he went through her papers after her death in 1976 that he realised the truth – his father had been an American GI who had enjoyed a brief affair with his mother before disappearing back to his homeland, leaving her pregnant with the only child she would ever have. This shattering discovery started Norman on the hunt of a lifetime. Only after 34 years of searching official archives and newspaper libraries and making repeated visits to the USA did he finally unearth the sad and extraordinary truth.